Attendees of Aging Research in Ontario meeting. Front row, left to right: Sally Chivers, Trent Centre for Aging & Society; Marie-Lison Fougère, Ministry for Seniors and Accessibility; Alexandra Papaioannou, GERAS Centre, Hamilton Health Sciences; Abby Katz Starr, Seniors Policy and Programs; Kate Dupuis, The Sheridan Centre for Elder Research. Back row, left to right: Susan Murphy, Institute for Life Course and Aging, University of Toronto; Lori Campbell, Gilbrea Centre for Studies in Aging, McMaster University; Richard Hughson, Waterloo/Schlegel/Conestoga Research Institute for Aging; John Puxty, Centre for Studies in Aging & Health, Queens University; Dana Murphy, Northern Centre for Research on Aging & Communication, Nipissing University; Laura Harrington and Parminder Raina, McMaster Institute for Research on Aging. Photo by Mitchell Bonaccorso. 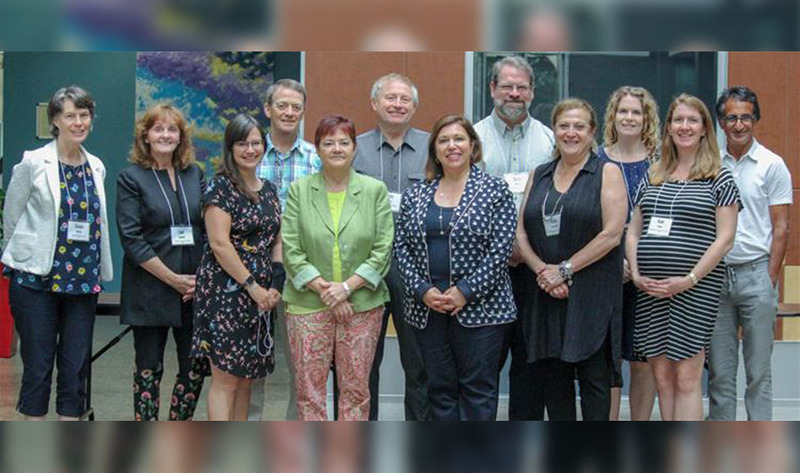 Leaders in aging research from several Ontario universities and colleges gathered at the McMaster Innovation Park last week to explore ways to work together collaboratively. The full-day, facilitated meeting was initiated by the McMaster Institute for Research on Aging, which recognizes that partnership is critical to develop actionable strategies that will address the opportunities and challenges facing our growing population of older adults. Marie-Lison Fougère, Deputy Minister, Ministry for Seniors and Accessibility, and Abby Katz Starr, Assistant Deputy Minister, Seniors Policy and Programs, were also in attendance. In her opening remarks, Fougère said “the drive for an interdisciplinary cross-sectoral approach is music to our policy ears.” She stressed the growing need for a cohesive and deliberately organized approach to addressing some of the complex and interconnected issues arising from aging. “There is an opportunity for us to work together more closely, to leverage each other’s strengths and resources, and to better coordinate our activities so that we can all benefit from our collective expertise,” he added. Post-secondary institutions represented at the meeting included the University of Toronto, Sheridan College, University of Waterloo, Nipissing University, Queens University and Trent University. Another meeting will be set for the fall in order to continue to the conversation and broaden participation to other institutions with a collective goal of enhancing research in aging for the benefit of older adults in Ontario and beyond. For more information about McMaster University’s robust activities in aging research, visit mira.mcmaster.ca and Brighter World. Leaders in aging research from several Ontario universities and colleges gathered at the McMaster Innovation Park last week to explore ways to work together collaboratively. The full-day, facilitated meeting was initiated by the McMaster Institute for Research on Aging, which recognizes that partnership is critical to develop actionable strategies that will address the opportunities and challenges facing our growing population of older adults. Marie-Lison Fougère, Deputy Minister, Ministry for Seniors and Accessibility, and Abby Katz Starr, Assistant Deputy Minister, Seniors Policy and Programs, were also in attendance. In her opening remarks, Fougère said “the drive for an interdisciplinary cross-sectoral approach is music to our policy ears.” She stressed the growing need for a cohesive and deliberately organized approach to addressing some of the complex and interconnected issues arising from aging. In a bid to take collective advantage of the research strength in Ontario, Parminder Raina, a professor in the Department of Health Research Methods, Evidence, and Impact at McMaster University, member of the National Seniors Council and scientific director of MIRA, posed these questions to the group: “How do we make collaboration go beyond <em>ad hoc</em> actions? How do we become more organized?” “There is an opportunity for us to work together more closely, to leverage each other’s strengths and resources, and to better coordinate our activities so that we can all benefit from our collective expertise,” he added. Post-secondary institutions represented at the meeting included the University of Toronto, Sheridan College, University of Waterloo, Nipissing University, Queens University and Trent University. Another meeting will be set for the fall in order to continue to the conversation and broaden participation to other institutions with a collective goal of enhancing research in aging for the benefit of older adults in Ontario and beyond. For more information about McMaster University’s robust activities in aging research, visit <a href="https://mira.mcmaster.ca/home" target="_blank" rel="noopener">mira.mcmaster.ca</a> and <a href="https://brighterworld.mcmaster.ca/channels/optimal-aging-mobility/" target="_blank" rel="noopener">Brighter World</a>.